Username and Password Reminder Home > Forget OPEC. Forget Supply. Forget Demand. Beware the US Dollar. Forget OPEC. Forget Supply. Forget Demand. Beware the US Dollar. While all eyes have been focused on OPEC, the US Dollar Index has made a stealthy turn lower with very little fanfare. Should the decline in the US Dollar Index start to gain traction, oil prices (and commodities in general) could be the big beneficiaries. Such an event would be quite fortuitous for both OPEC and North American shale producers. 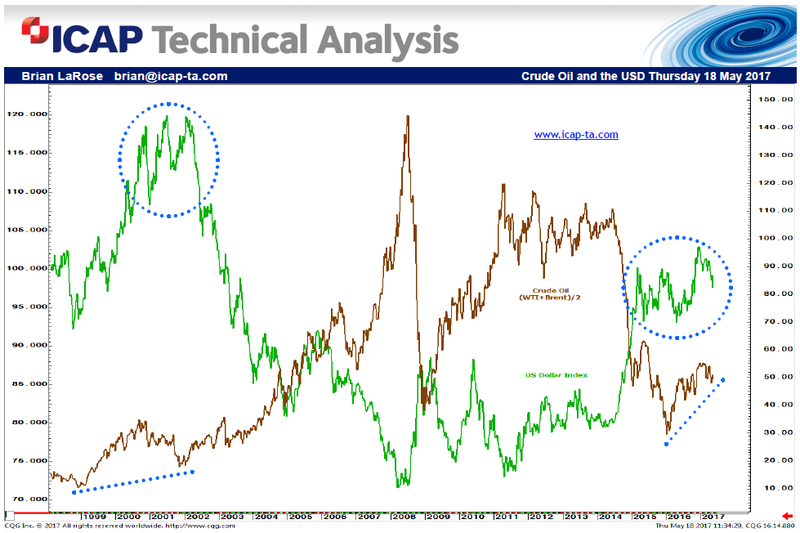 …On the other hand, a sudden resurgence in the US Dollar Index could very well send energy prices crashing, which could be quite devastating for both OPEC and North American shale producers. This entry was posted in Chart Blog. Bookmark the permalink. The economic or market commentary contained in this presentation is based on information that ICAP Technical Analysis, a division of ICAP Corporates, LLC (“ICAP”) believes to be reliable, but has not been audited or verified by ICAP for accuracy or completeness. This commentary is provided to you for informational and educational purposes only, and is subject to change without notice. Principals and employees of ICAP and its affiliates may trade, for themselves, for ICAP or for customers, in the financial instruments or financial markets discussed in this presentation, taking positions similar to, or opposite to, the positions or market movements discussed in the presentation. Nothing in this presentation is intended to constitute a trade recommendation. The recipient of this presentation should take into account the recipient’s individual objectives, financial resources and needs in deciding whether to use any of the information in the commentary. Futures, options and other derivatives trading involves substantial risk and is not suitable for all persons. By viewing this information you are agreeing to the ICAP-Technical Analysis Terms of Service.